Last night this foster Mama dog had 8 puppies! I watched with delight while sending angels and fairies to her as I watched this unfold on Facebook. It was truly amazing. The next morning we tuned into her to send her healing and hear what she had to share about this experience and how she is feeling. Rhea said (she’s not attached to her name.) 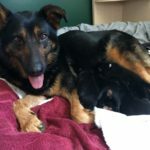 Rhea feels so grateful for all the love and kindness that has been showered over Rhea and Rhea’s puppies. Rhea is not looking back only here and now. Rhea’s gaze is on each puppy . Rhea looks ahead with anticipation and for the first time in SO LONG OPTIMISM. Rhea believes there are far better things now in the present than Rhea has ever received. There is food, there is water, there is love, there is kindness here for Rhea and Rhea’s puppies . Rhea does SIGH and feel relaxed in between feeding and caring for all the puppies. The house that the puppies are in is FILLED with angels and fairies. Truly a wonderful place to be for all the animals there. Shortly after the session we heard that Mama was eating! Everyone was happy. We send lots of love to the family. I love how she is filled with hope and not thinking about where she came from, what the past story was but filled with hope for her future.